NOTHING WRONG WITH THESE WE JUST BOUGHT TOO MANY, GOOD DEAL FOR YOU, PLEASE CALL IF YOU HAVE QUESTION, BEST PRICE POSSIBLE!!!!!! 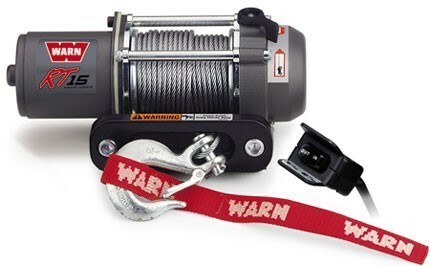 WARN INDUSTRIES 78000 A Pulling Tool for Smaller Quads With Big Ideas The RT15 is the perfect all-around winch for sport quads and small ATVs. Its 1,500 lb. capacity and 50' of wire rope turns compact ATVs into workhorses. Features include a 3-stage planetary geartrain; a patented disc brake for great control; a sealed motor to keep the elements out; and a handlebar-mounted mini-rocker switch for power in/power out. An efficient electrical system for less battery drain and a hawse fairlead round out the RT15's features.